A case of Pneumatosis Cystoides Intestinalis has been reported by Dr. Yuusaku Sugihara and associates which has been published in The New England Journal of Medicine. The contributors have presented a case report of a 48-year-old woman who presented with a several-month history of abdominal fullness. She also had a history of eosinophilic pneumonia, which had been treated continuously with glucocorticoids for 7 years. 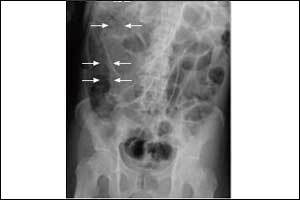 On examination, her abdomen was distended but soft, with normal bowel sounds. Computed tomography (CT) of the abdomen showed air in multiple small cysts within the wall of the colon (arrows) and free air under the right hemidiaphragm (arrowhead), findings consistent with a diagnosis of pneumatosis cystoides intestinalis. This condition is characterized by the presence of numerous gas-containing cysts within the submucosal or subserosal layer of the intestinal wall. The pathophysiology is incompletely understood. Pneumatosis cystoides intestinalis may be associated with a range of gastrointestinal conditions, from intestinal ischemia to inflammatory bowel disease, as well as with endoscopic procedures, mechanical ventilation, and pulmonary diseases. Management of the condition is guided by the severity of the clinical presentation, which can vary on the basis of the underlying cause. The patient was admitted to the hospital, where she received supportive care, including oxygen administered through a face mask. Over the next 3 days, her abdominal symptoms decreased, and a repeat CT showed resolution of both the free air and the air in the intestinal wall.